In the present day François de Nomé continues to be associated with the name of Monsù Desiderio, a name traditionally used to cover the work of two different artists: Francóis de Nomé and Didier Barra. Both artists, who have recently been distinguished from each other and identified, were natives of Metz and were active in Naples during the first half of the 17th century, where on occasions they worked together. François de Nomé moved to Rome at the age of around eleven. He trained there with the Master Baldassare, who was probably the Flemish landscape painter Balthazar Lauwers, also known as Lauri. In addition to the influence of that artist’s work and of Paul Bril, François de Nomé’s paintings look to the elaborate architectural compositions of Hans Vredeman de Vries and to theatrical scenes by Jacques Callot and Giulio Parigi. From 1610 onwards De Nomé is documented in Naples where he remained for the rest of his life. By the end of the second decade of the century his works had acquired a certain reputation and in 1618 he received his first important commission for a cycle of twelve paintings on episodes from the life of the Pharaoh (location unknown). François de Nomé’s work is characterised by his use of a small format and the application of heavy impasto. The chronology of his oeuvre is difficult to establish as only a few of his paintings are dated and the figures in these dates are difficult to read. 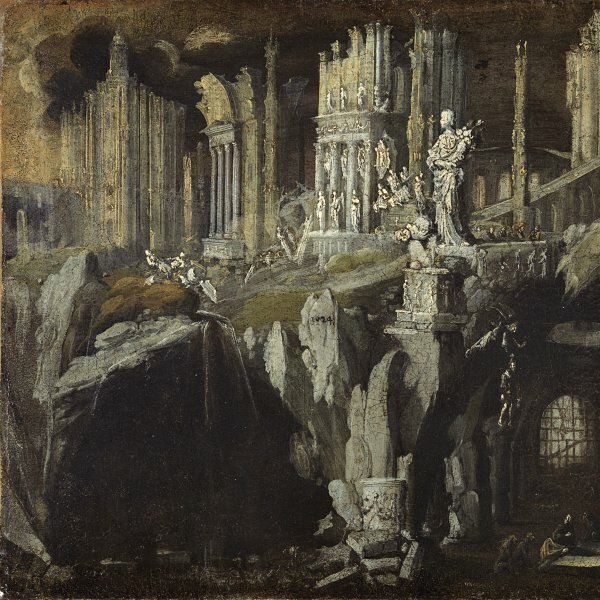 The works attributed to him show a preference for two themes: firstly, perspectival views of streets and churches, and secondly, highly ornate ruins and fantastical buildings that act as the backdrop for biblical narratives painted on a small scale. The figures in his compositions were often painted by other artists including Belisario Corenzio and Jacob van Swanenburgh.